Communities that participates in their own development gain a sense of ownership of their future. 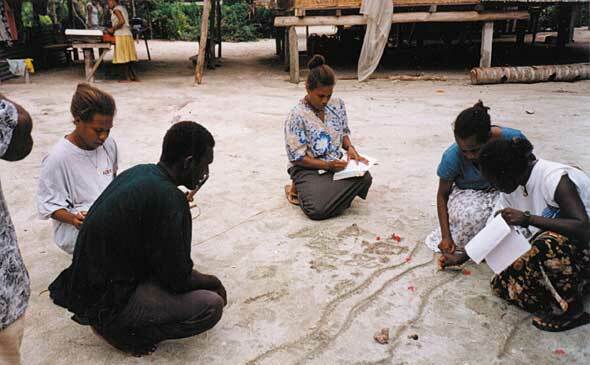 Participants in a training programme map information in the sand. Mapping is one of a number of participatory tools used by TerraCircle trainers. The techniques TerraCircle uses to design and implement project work are chosen to encourage the participation of members of the commuity. They can be described as Participatory Action and Learning. TerraCircle encourages the attitude among project partners that development requires a committment by the community, that aid is not something that is simply 'given' by organisations in developing countries - that is, aid is not charity but is a cooperative endeavour that shapes the future of communities. involve the community in making desicions, assessing trials and putting development strategies into action. PRA offers a selection of techniques that encourage the participation of community members, clans and families in their own development. PTD involves village farmers in the trialing and assessment of new techniques and technologies. decision-making by farmers as to whether or not they want to adopt new ideas; the decision is based on their experience during field trials. Community foods security assessment is a participatory approach to assessing the capability of a community to continue to provide its own food needs. Using this information, a program of training and agricultural improvement is developed. The experience of TerraCircle trainers has led to the adoption of the LEISA approach to small scale agricultural development. increased food security in case of natural disaster or conflict. LEISA is an approach under constant improvement. It is adaptable to regional and local circumstances and is used worldwide by development professionals.